The holiday season can often be considered a tough and terrible time for those grieving over the loss of family or loved ones. And all of the spiked eggnog and jingle bells in the world can hardly ease the burden. But while focusing on such heartbreaks, the filmmakers of Christmas Everlasting are hoping to remedy the crisis, for starters, by dropping warm nostalgic vibes of Nat King Cole into the musical soundtrack. Cole’s “The Christmas Song” and “Caroling, Caroling (Christmas Bells are Ringing)” and some cozy Andy Williams are on full display, transporting us all back to an era of timeless holiday music. Spoiler alert ahead, Christmas Everlasting, based on Marie Bostwick’s book The Second Sister, doesn’t stray too far from the typical Hallmark movie experience. It opens like a Disney fairy tale: Attorney Lucy Toomey, played by Tatyana Ali (Fresh Prince of Bel Air), gets an unexpected promotion around Christmastime and she’s getting ready to pay for her sister’s roundtrip fare to snowy New York for some sibling time. Then only minutes in, it all comes crashing down due to an unexpected tragedy, and Toomey has to return to her old campgrounds, where her sister Alice resided. Yeah, enter the sad, unfortunate passing of Alice, who we only see in a few scenes via Lucy’s reminiscing flashbacks. Sadly, you can predict this load of drama minutes into the film. It definitely was lingering in the faux snowfall. Alice’s return home forces her to confront some of her unresolved issues, personal demons and lots of regrets. But don’t get it twisted: the issues aren’t super-duper taxing. The biggest of them is actually regarding the future of Alice’s estate. The other, a shoo-in for a Hallmark tale, is a budding re-romance with a written-off ex. Y’all love-hungry sistahs can entertain this part of the flick if you want; it’s a yawner for me. 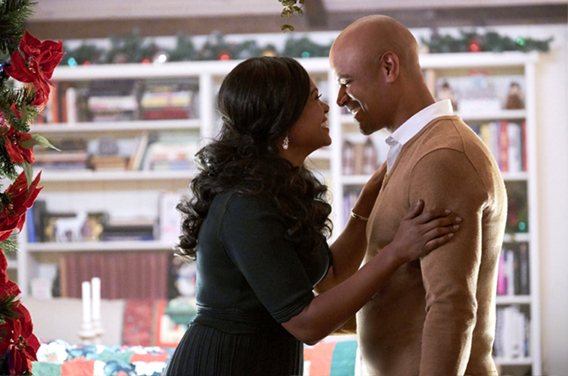 Heck, there’s hardly a good kiss from Lucy and the handsome beau Peter (Dondre Whitfield), which sorely discounts this from even being considered a romance. Some of the lines in the film are of the B-movie caliber, loaded with such saccharine. Dennis Haysbert, most famous for being that guy on the Allstate commercials, plays Uncle Bernie. And in a weird serpentinous way, he lands one of the most peculiar lines in the movie when talking to a stubborn Lucy during one of their first scenes: “I get it/Time moves pretty fast these days.” It sounds like Haysbert is auditioning for his insurance competition, Nationwide. 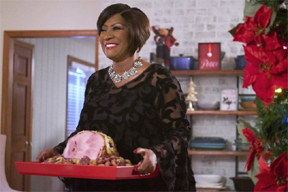 And Patti LaBelle fans are desperate to witness what she contributes to the film, especially since she gets a hot spot in the actors’ lineup. Sigh, the R&B diva only appears in two scenes, one of them in the kitchen and without a Patti sweet potato pie in place. And her time on the screen is so short that you’d think the “On My Own” singer showed up just for sympathy points. The movie tries too hard to be a holiday movie. Every scene, every picture, even flashbacks to Lucy’s childhood and adolescence, is trapped in an icy winter wonderland. 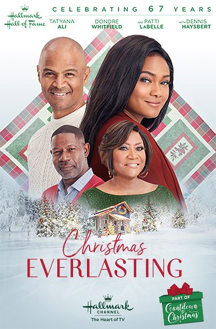 The scenes in Christmas Everlasting are completely trapped in Christmastime, which isn’t necessary of holiday films, but hey — maybe the producers felt like gifting black cinema with an adult spin on A Christmas Story, minus the humor. The acting isn’t exactly all that crisp either. It feels like, well, a TV movie. So don’t expect totally strong performances here. There are also a number of technical woes in play, like the absence of cold breath in frigid temperatures as the cast makes their casual walks on the snow and ice. Yeah, that simply irked me. Being up north in Wisconsin during the holidays comes with massive loads of chilly behavior. After watching this blunder, you’d think that global warming had sucked all the arctic air out the scenes. Where’s the CGI when you need it. But, without going into full Grinch mode on the Ron Oliver-directed romantic drama, the storyline is pretty solid, piled with something fresh and spontaneous to give to the holiday movie phenomenon. Lucy’s whole assessment of her departed sister’s estate and the written requirement as heir — to move back home to the fictional town of Nilson’s Bay in Wisconsin and inheriting Mr. Freckles, her cat — adds some surprise and a slice of humor to the storytelling. There’s also some hometown superhero magic that Lucy needs to conjure up, allowing her to utilize some of her New York lawyer skills. It’s just a little bit unfortunate that the film isn’t as polished as it deserves to be. But hey, it’s cute for a snuggle-up TV movie. 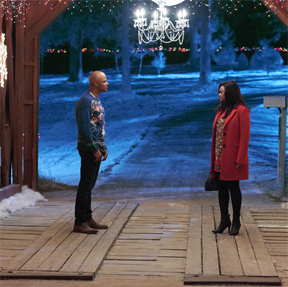 Christmas Everlasting is just one of the first films to roll out of Hallmark Channel‘s Hall of Fame series this year. Thirty-seven of them, all newly made and all with “Christmas” somewhere in its title, will debut this November and December.